The RMST series of marine speakers by Rockville is our step up series that offers a 1˝ titanium tweeter as well as more power handling! They have a larger magnet and can handle 100 watts RMS & 400 watts peak! If you are using an external amplifier we recommend this series. These speakers are completely waterproof and protected from the elements! They are UV treated and have a special waterproof coating to prevent water damage. Also these speakers come with a 1 year warranty to give you the peace of mind you deserve when purchasing from Rockville! 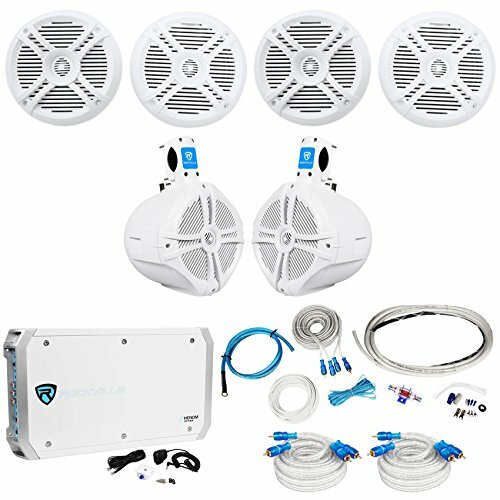 Rockville RMST65W 6.5" 2-Way 800 Watt Marine Boat Speakers in White (Pair). CEA Compliant Power Ratings. Power Rating: 400 Watts Peak /100 Watts RMS Per Speaker. System Power: 800 Watts Combined. 6.5" 2-Way Speaker System. Fully Marinized Against Salt & Fresh Water Conditions. Completely Waterproof and rustproof . Stainless Steel Terminals. Molded ABS plastic basket. Polypropylene Mica Injected Cone . Rockville RXM-S6 Marine/Boat 6 Channel Amplifier 2600 Watt Peak / 1300w RMS. CEA Compliant Power Ratings: . 420 Watts (6 x 70 Watts) at 4 ohms and 1% THD+N . 660 Watts (6 x 110 Watts) at 2 ohms < 1% THD. 660 Watts (3 x 220 Watts) bridged @ 4 Ohms < 1% THD. RMS Power Ratings . 1300 Watts (6 x 220 Watts RMS) @ 2 ohms . 1300 Watts (3 x 440 Watts RMS) @ 4 ohm Bridged . 780 Watts (2 x 130 Watts RMS) @ 4 ohms. Rockville RMWK4 4AWG Guage Waterproof Marine/Boat Amplifier Wire Installation Kit. 25' Translucent, Twisted Pair, High Quality, Tinned-CCA Flexible PVC RCA Cable. 20' 4 Gauge High Current, Low Impedance, Clear Flexible Power Cable with 3' Black Poly Woven Mesh to better resist chemicals in the battery compartment. 4' 4 Gauge High Current, Low Impedance, Light Blue, Flexible Ground Cable. Rockville MRCA20 RCA Interconnect Cable . Premium Audiophile Marine RCA Interconnect Cable. High Performance Water Proof RCA Plugs. Tinned Copper Strands for Sonic Purity. Outstanding Noise Rejection, Accuracy, and Frequency Response..